Tue., Jan. 22, 2019, 3 p.m. The top of my refrigerator is home to a hodgepodge of oils, vinegar and cooking equipment. The most-used items have made their way to the periphery, where I can easily reach them (and, it seems, knock them over onto my head). They include extra-virgin olive oil, canola oil and two types of cooking oil spray. While oils and oil sprays serve many of the same purposes, the latter are particularly useful for a variety of kitchen tasks. Here are a few ideas and tips for using that spray can, which can do a lot more than coat your bakeware. Remove your cooked foods without tearing. There’s a reason cooking oil spray is often called nonstick cooking spray. A fine, even layer prevents food from burning and adhering to pans without necessarily turning it greasy. I use it to coat the dish for my Cheesy Chicken Enchiladas, for instance. It’s also ideal for baked goods, especially blondies and brownies that need to be lifted out of a pan. You can apply the spray directly to the pan or to a parchment or aluminum foil sling you create to facilitate lifting the slab out all at once. Coating a loaf pan will help a quick bread slide right out, too. While I tend to prefer greasing cake pans with butter, since it’s often already included in the recipe, spraying the bottom of the pan with cooking oil spray can hold in place the parchment round you use to make the cake easier to turn out. Cooking oil spray is a natural in muffin tins as well. Bakers, however, will want to consider having on hand a baking spray, which combines cooking oil spray with flour. I’ve found this to be particularly effective for releasing cakes and muffins. Pulling out the baking spray is easier and quicker than applying separate grease and flour layers, and I won’t use anything else when it comes to particularly tricky pans, such as a Bundt, where it can be more difficult to evenly cover every nook and cranny. Keep sticky ingredients from getting stuck. Perhaps my favorite use for cooking oil sprays is on the inside of measuring cups or spoons when I’m portioning ingredients such as honey and molasses. It also comes in handy on my spatula when I’m stirring the mixture for homemade marshmallows. I like to spray my knife when it comes time to cut the finished marshmallows. That same strategy is useful when you have to chop dried fruit. Spraying a little cooking oil on your hands while forming meatballs or burger patties is another handy prep strategy. Protect your rising bread dough. Bread recipes often call for covering the bowl or baking sheet with a piece of plastic wrap. In that case, it’s helpful to coat the plastic with cooking oil spray to keep it from sticking to the dough, which could deflate or tear it if you have to resort to yanking the plastic off. Use for broiling or baking food. In testing a recipe for eggplant Parmesan, I broiled eggplant two ways: Brushed with olive oil and coated with cooking oil spray. If you’re roasting food on a wire rack set inside a baking sheet – ribs, for example – you’ll want to coat the rack with cooking oil spray. If you’re making oven-baked versions of typically fried fare, say, chicken tenders or breaded fish, you can spray the crumb-coated food (use panko for extra crispness) with cooking oil for crunch and golden-brown color. Scrubbing a box grater is up there as one of my least favorite kitchen tasks. A spritz of cooking oil spray on the holes before you begin shredding will leave less mess to deal with. But make it easy to clean up. Really, no matter how careful you think you’re being when using cooking oil spray, it spreads more than you think it does. (Says the person who just had to wipe down a stove top I inadvertently spritzed.) 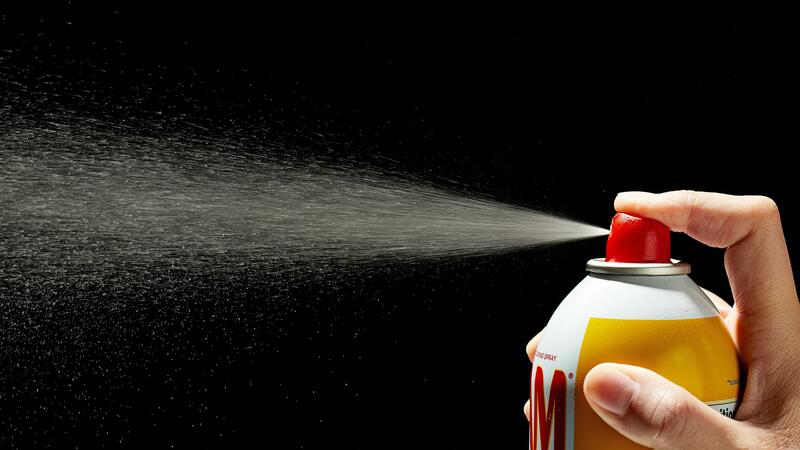 Avoid additional cleaning by using the spray over a sink or trash can. Your counter top and appliances will thank you. Don’t use on nonstick cookware. Manufacturers warn that cooking oil spray can not only burn but also leave a sticky residue that can affect the release of food from the pan. At least one brand warns that using cooking sprays will void the warranty on its nonstick products. Whether it’s a matter of being thrifty, not having to toss or recycle the canister or wanting something without the anti-foaming agents and propellants found in some store-bought sprays, you can still get the benefits of a cooking oil spray. It’s worth keeping in mind that in a test of cooking oil sprays, Cook’s Illustrated still preferred traditional Pam over other additive-free brands, which had a tendency to burn and did not disperse as evenly. If you do not want to use store-bought spray, you can invest in an oil mister, which you can fill with your oil of choice and is especially nice if you plan to use it on meat or salad greens. In a separate test of oil misters, Cook’s found that none were quite as consistent or even as a can of Pam, but at least one came close. Published: Jan. 22, 2019, 3 p.m.